​Discover the art of French Crepes, taught by Connie Mar, a Paris trained Le Cordon Bleu Pastry Chef. 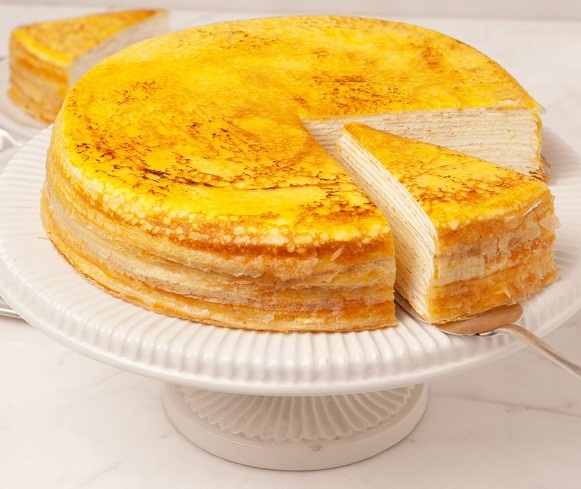 Then become an expert at making crepes by making 20 layers to complete your very own 9" Mille Crepe Cake to take home. Between the crepe layers, you'll learn the secret recipe for the "light as air" pastry cream and whipped cream filling, then you'll flavor it with your choice of vanilla, cocoa or matcha. Ah dessert heaven! $110 per person. All ingredients to make the cake will be supplied. Max. of 5 people per class. DATE: Saturday, Feb. 18. 12 - 4 pm. Or please email me with your preferred date and I'll post it here to see if others can join on that day. TAKE HOME: one large 9" 20 layer Mille Crepe Cake in a beautiful Pink Bakery Box and Wooden Crepe Stick. There will be a variety of brand new crepe pans to use so that you can determine which one suits you the best. Crepe pans are sold separately and prices start at $35 each. Please note: this cake should be enjoyed on the same day that it is made. Please plan for a party at home with your favorite dessert lovers! Location: Private home kitchen near King Edward and Cambie Street, Vancouver, BC.